Three former Yugoslav army officers charged over a massacre in a hospital in Croatia in 1991 have gone on trial in The Hague. 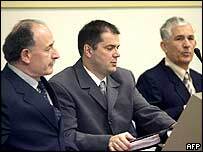 Veselin Sljivancanin, Mile Mrksic and Miroslav Radic are accused of allowing Serb troops to kill over 250 patients and refugees at the Vukovar hospital. The three defendants deny murder, torture and persecution. The capture of Vukovar by the Yugoslav army was a pivotal event in Croatia's 1991-1995 war for independence. At the start of the war in Croatia, hundreds of refugees, hoping to be evacuated in the presence of international observers, gathered at the Vukovar hospital. Prosecutors say the Yugoslav army handed 400 Croats and non-Serbs over to Serb rebel forces. They say as officers, Mr Sljivancanin, Mr Mrksic and Mr Radic should have known what would happen to the victims. The victims were forced on to buses and taken to a remote location where at least 264 of them were killed and buried in mass graves, according to the indictment. The men are also accused of trying to cover up the murders afterwards. After more than seven years on the run, the three were arrested and transferred to the UN International War Crimes Tribunal in 2002 and 2003. The trial is expected to last up to six months. The Vukovar massacre is specifically mentioned in the indictment against the former Yugoslav President Slobodan Milosevic. In Serbia, a major trial of 17 people accused over the killings got under way earlier this year.